Discover how the Holy Week is celebrated in the Canary Islands. 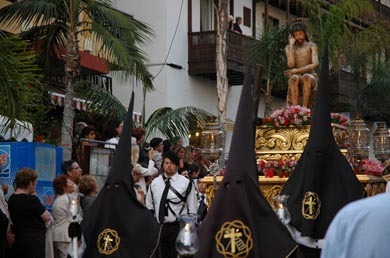 The Holy Week is a religious festivity celebrated in the Canary Islands. Celebrations start on the Palm Sunday and continue till the Resurrection Sunday. Thousands of tourists decide to spend their Holy Week Holidays in the Canary Islands, and this is due to the fact that in the Canary Islands apart from the magnificent processions, followed by many christians, a great climate and entertainment offers are available during this period. The Holy Week is celebrated in different ways depending on the island you’re in. The most famous are the Tenerife’s celebrations, with an important historic and artistic value. Hundreds of people walk through the streets on big wheeled cars. In the Canary Islands as well as in whole Spain, the most important days in the Holy Week are the Holy Thursday where spectacular monuments are exhibited, the Holy Friday, as it’s on this day’s dawn that happen the most famous procession. If you wish to spend your holidays on the Holy Week in the Canary Islands you might take a look at the available hotels on the island and make a free-commitment reservation from here.